My dear readers, I need your voices. By now, you must have heard about the Death By Chocolate Contest organized by Culinate, where everyone is invited to vote for his or her favorite blog post about chocolate. The Grand Prize for this contest will be a trip for two to the gorgeous Napa to attend the Copia center’s “Death By Chocolate” Festival on February 28, 2008. The best part about this contest is that you don’t have to be a food blogger to have a chance to win. You heard me right: Just by voting for you favorite food blogger, in this case me, you will have a chance to win a trip for two to Napa as well. The winner among readers will be chosen at random from all entries. I have submitted my all time favorites: Jacques Pépin’s Chocolate Truffles Trio. I hope you enjoyed them as much as I did sharing them with you. Although there are some great chocolate entries out there, I am going to shamelessly ask you to please vote for me. The top ten vote-getting blog posts will move on the final round, where the winner will be chosen by an esteemed panel of culinary and chocolate experts. Please, make this be a birthday present before my birthday (which actually is two months and seventeen days away). You will not only make one of my dreams come true, but also get yourself a chance to win a trip to Napa along the way. You can register now for your chance to win then come back Monday, February 4 to vote, which will increase your chance to win. On the right column of my blog, there is a direct link (the Death by chocolate Logo) that will take you immediately to where you can vote for me. Voting will conclude February 8 and the winners will be announced February 9. Good luck to all of you and don’t forget to come back Monday to vote. Your voices mean a lot to me! Now we shall go back to the kitchen with this simple and delicious Almond crusted French Toasts that I made this morning for breakfast. 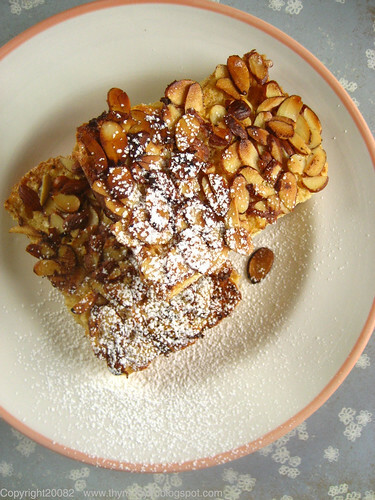 The almonds browned in butter bring a nutty crunch to the French toast. If you have one of those nuts oil by La Tourangelle, I used the roasted walnuts oil, by all means use a bit of it with the butter. They really enhance the nuttiness of the finished toast. The best part about the recipe, besides being easy peasy, is that you can prepare the batter the night before and make your French Toasts in the morning. You can either dredge both sides in almonds or just one side, like I did. I used some leftover orange and fennel seeds Challah bread, but plain Challah, Brioche or even slices of Baguette are good substitutions. These will give a note of sophistication and warmth to your breakfast but without the huff and puff of the usual sophisticated breakfast. I hope you will make them and enjoy them as much as we did. Put oven rack in middle position and preheat oven to 275°F. Whisk together eggs, half-and-half, sugar, vanilla, and salt in a large shallow dish until combined well. Spread almonds on a large plate. Soak 4 slices of bread in egg mixture, turning over once, until saturated. Working with 1 slice at a time, remove bread, letting excess egg mixture drip off, then dredge in almonds to coat both sides, gently pressing to help adhere. Transfer to a plate or wax paper. Repeat procedure with remaining 4 slices. Heat 1 1/2 tablespoons butter and 1 tbsp walnut oil in a 12-inch heavy skillet over moderate heat until foam subsides, then cook 4 bread slices, turning over once, until almonds and bread are golden brown, 5 to 6 minutes. Add remaining 1 1/2 tablespoons butter and cook remaining 4 slices in same manner. Transfer French toast to a baking sheet as cooked and keep warm in oven. 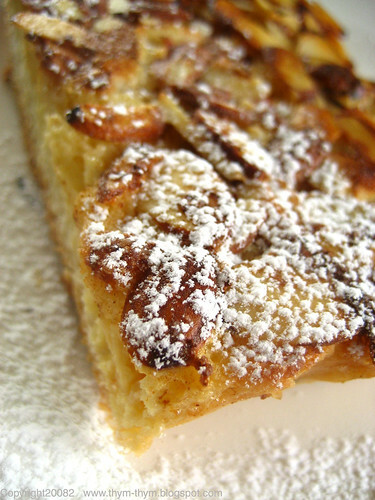 Serve with some confectioners sugar dusted on top. Mettre votre grille du four au milieu et préchauffer a 135C. Dans un grand bol, battre les oeufs, lait, crème, sucre, vanille, et sel. Mettre les amandes effilées sur une assiette. Faites tremper chaque tranche de pain des deux côtés. Laisser bien égoutter l’excès de liquide et presser chaque coté sur les amandes. Continuer avec le reste. Faites chauffer 1 ½ c.s de beurre dans une poele assez large et faites frire les tranches de pain, de chaque côté et sans trop encombrer la poele, jusqu’à ce que le pain et les manades soientbien dorés, environ 5 a 6 minutes. Ajouter le beurre restant et continuer avec les reste des tranches. Servir tout de suite ou mettre au four au fur et mesure pour les tenir au chaud. Good luck in the contest -- your truffles are so beautiful! And this French toast is lovely too. 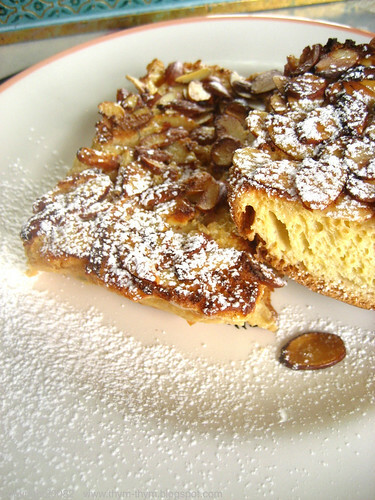 I've had such a craving for French toast lately -- will have to try this recipe. it looks terribly yummy !!!!!! the "pain perdu" is one of my best childhood souvenirs :) We used to eat some on sunday evenings instead of the dinner, when mum was tired of cooking ! Yum!!! That's gorgeous pain perdu--I think I'll try it out as dessert. :) With raspberries. - Lydia, thank you very much! I actually made these not only to save my leftover challah, but also because it was a while since I had them. Even my daughter loved it! - Marion, that is funny because my mother would made pain perdu also on Sunday and for the same reason;) Where they at the same school or something? - Annina, welcome fellow DB! Glad you enjoyed the blog and thanks for the link! - Chou, Rasberries! sounds heavenly!You're taking pain perdu to a whole new level! Lucky bread! Could you please make this for us tomorrow morning? :) I am nuts about nuts and your pain perdu is a dangerous combination of my favorite things - nuts & egg custard! I will cast my vote for your truffes - I have edible proof they were divine! What a fantastic French Toast recipe! So unique. - Ma chere Christine, thank you very much! I'll make it anytime you want! Warda- Congratulations on making it to the top 10 in the contest! Your recipe was wonderful. Good luck!